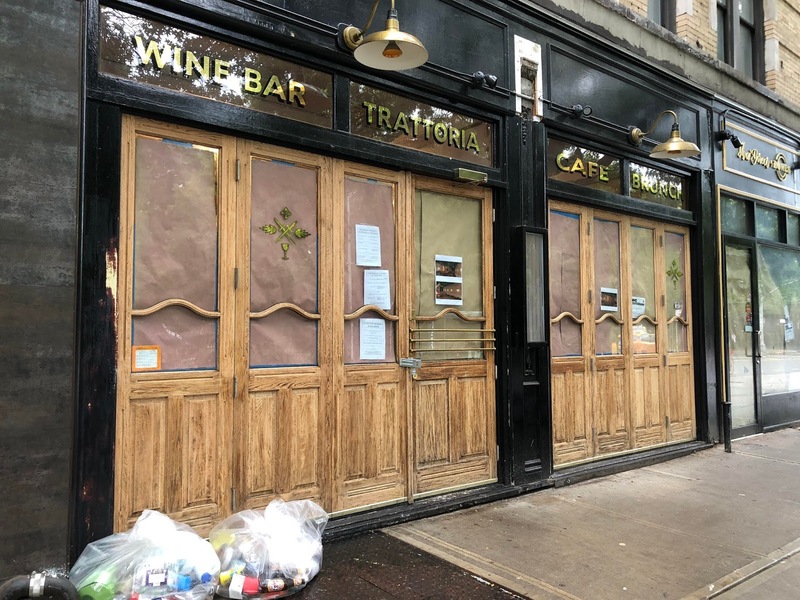 A Japanese restaurant is coming to 131 Avenue A between St. Mark's Place and Ninth Street. Applicants representing an LLC called Ays Noodle Company have applied for a beer-wine license for the former Baci e Vendetta space. The applicants are on tonight's CB3-SLA agenda, though this item won't be heard in front of the committee. According to the questionnaire on file at the CB3 website (PDF here), Tabetomo will be open daily from 11 a.m. to midnight. The questionnaire lists eight tables to accommodate 24 diners. There's also a 15-seat bar. 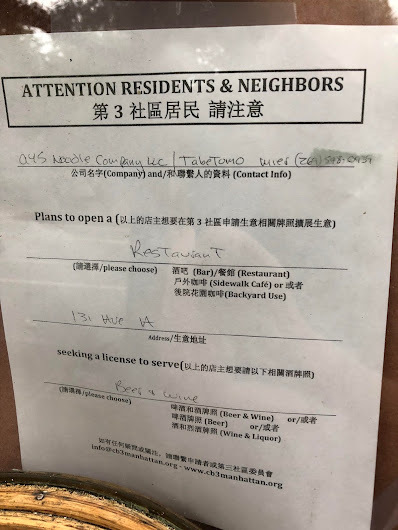 The applicant, Tomotsugu Kubo per the CB3 questionnaire, has management experience at the popular Tsujita LA Artisan Noodle, which apparently serves "life-changingly good" tonkotsu ramen and tsukemen, and the Tsujita LA Artisan Noodles ANNEX ... both in Los Angeles. 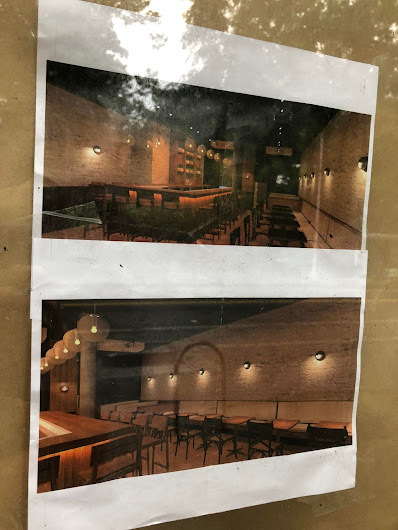 No word on menu items for Avenue A just yet. This is the second L.A. ramen transplant to venture into the East Village this summer. Tatsu Ramen, with two locations in Los Angeles, opened its first NYC outpost last month at 167 First Ave.
Baci e Vendetta closed at 131 Avenue A in March after nearly 16 months in service. Nic Ratner, a partner in Baci e Vendetta, told me that business for the Italian cafe wasn't sustainable with only a beer-and-wine license. This space was the 10 Degrees Bistro until the fall of 2015 ... and the Flea Market Cafe before that. Are you kidding me? ANOTHER new asian noodle shop in the East Village?? Every time a place shuts down, a new asian restaurant takes its place within 6 months. I'm all for diversity of cuisines, but this is getting ridiculous. Not a huge fan of "Sinosphere" cuisine, nor this recent wave of restaurants around here, but there does seem to be quite a diversity to the new offerings. I.e. we're not getting a bunch of the very same kind of restaurants. Lumping all "Chinese food" together is probably tantamount to lumping all "Western food" together. Some people will see a description like "asian noodle shop" and think they know exactly what it means, while others would find it laughably vague. Only in America I suppose. Every time one of these LA ramen restaurants tries to swoop in and tell us all about what's what, it makes me even more biased towards our local ramen places. I don't have a problem with LA in general, but I wish they'd stop trying to enlighten us. We have some pretty good food here ourselves. The Block association has been very vocal about not having another bar/restaurant on that block. They have stood up at each and every CB3 meeting and denounced anything obtaining a lic to sell beer/wine/liq. @ Unknown, that space has always been a restaurant. I wouldn’t mind a good ramen place in there. What does the block association want? Banks have come and gone. The Chase and Citibank spaces have been empty for ages. Another indistinguishable juice place? Why are Asian restaurants all lumped together for other cultures are not? I don't see people bemoaning, "Another new European restaurant!" This is Japanese, not Chinese, albeit by way of LA. Why don't we judge each place on its merits?